The tennis powerhouse is staying incredibly fit and active throughout her pregnancy—and she's sharing her top tips for other women who want to do the same. From winning the Australian Open during her first trimester to playing tennis effortlessly in her third, Serena Williams is redefining what it means to have a fit pregnancy. It's no surprise—after all, Serena is one the greatest athletes the world has ever seen—but it is incredibly inspiring. That's why we jumped at the chance to speak with Serena. 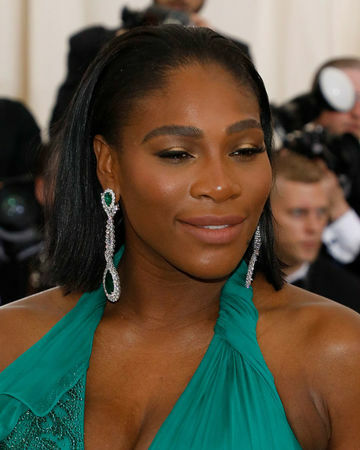 We joined a conference call with the tennis legend to discuss her plans for motherhood, the details of her pregnancy, and her parternship with Tempur-Pedic: Serena has been sleeping on the brand's beds for 10 years, and she's joined its "sleep is power" campaign. Obviously, being in amazing shape before pregnancy makes a world of a difference, but we also know that staying in top shape during pregnancy is challenging for everyone. We asked Serena to spill her top secret to maintaing the healthiest, most active pregnancy possible, and she obliged. “I think it’s really important to do a little bit a day, even if it’s just 20 or 30 minutes. I think that’s been super important," she told Fit Pregnancy. "And really, getting great sleep. It’s an effect: If you start out the night and get really bad sleep—which is so common in pregnant women—next thing you know, you are too tired to work out, too tired to function, too tired to eat healthy. It just starts to go down from there, so it’s so important to make sure you get [a lot of] rest. Most pregnant women tend to get really bad sleep because of the extra weight, the distribution of the weight, all these other factors." Serena also spoke to reporters about winning the Australian Open during the early phase of her pregnancy. “My health was the biggest concern for me when I was playing in Australia. I spoke to some doctors that I’ve worked with my whole life, and I obviously let them know what was going on…It worked out great, but that was the biggest concern for me," she said. And while Serena is exercising throughout her pregnancy, she may not play until she delivers. “It’s been really different. I’m playing but I’m just hitting balls. I’m not doing anything crazy, you know?" she said. "That’s been interesting. It’ll be amazing if I could play till my due date, but that’s not the goal. The goal for me is to just play, be healthy and have a healthy pregnancy above all. I just do some light working out so I can stay fit." Tennis is in the star's post-baby plans, but she's ready for whatever changes motherhood brings—just don't expect everything to change. "I think the transition will be great," she said. "[Motherhood] is not going to change who I am, the soul of who I am, the soul of what I am."